Saad Dawabsha died early Saturday morning from severe third-degree burns covering 80% of his body – caused by arson committed by racist Israeli settlers. Authorities let them rampage freely against Palestinian civilians. Official expressions of outrage against the murder belie Israel’s longstanding genocidal policy. Saad’s 18-month-old son Ali was burned alive in the vicious attack. It wasn’t the first time extremist settlers set a Palestinian home ablaze. For sure not the last. Saad’s wife Riham and four-year-old son Ahmad remain in critical condition – suffering from third-degree burns covering most of their bodies. They’re clinging to life precariously. Longstanding Israeli high crimes against defenseless Palestinians continue unaccountably. Settlers are protected by Israeli soldiers and police. They commit violence and vandalism repeatedly. Rarely is anyone held accountable. On Saturday, settlers firebombed another Duma village Palestinian home where the Dawabsha family lives. Mahmoud Fazza al-Kaabna’s house was attacked. Settlers threw firebombs at its outer wall. They didn’t smash windows and hurl them inside – the way they destroyed the Dawabsha home. Israeli police say they’re unable to identify settlers responsible for the arson deaths. It begs the question whether they’re even trying. Reports indicate Duma village security cameras were removed – perhaps to suppress incriminating evidence. Israeli police spokeswoman Luba Samri said more leads are needed. Although right-wing extremist/racist Meir Kahane’s grandson Meir Ettinger was arrested, he’s not a Dawabsha arson attack suspect. He’s detained “because of his activities in a Jewish extremist organization,” according to a Shin Bet statement. He’s suspected of committing “nationalist crimes” – including July’s arson attack on the Church of the Multiplication of the Loaves and Fishes on the Sea of Galilee’s northwest shore, on the site of two earlier churches, the oldest dating from 380AD. Arson damaged the church. Two people were injured. On Friday, Israeli warplanes terror bombed central Gaza near the Nuseirat refugee camp. 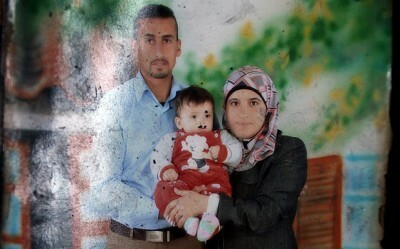 At least four Palestinians required hospitalization. It’s unclear how severely they’re injured. Israel repeatedly attacks Gaza for any contrived reason or none at all. The entire 1.8 million population is threatened. It remains lawlessly besieged. A year after Israel’s summer 2014 aggression, it continues blocking enough construction materials to let affected Gazans rebuild their shattered lives. Earlier this week, Israel without notice or justifiable reason cut off Kafr Qaddoum village’s water supply. Hundreds of cattle, chickens and other animals perished. Only residents with water tanks or stored water bottles have anything to drink. If supplies aren’t restored, more livestock and crops will be lost. The Israeli company Mekorot steals underground reservoir water on privately owned Palestinian land, selling it for profit. Most Palestinians depend on agriculture for survival. Everyone needs enough water to survive. A permanent Israeli state of war on defenseless Palestinian exists – including soldiers committing cold-blooded murder and brutal security force attacks against peaceful West Bank marches for long denied justice. Friday was like most other days. Soldiers viciously attacked Palestinians joined by activist Israeli and foreign activists. Bil’in, Nabi Saleh and al-Masara peaceful marches were targeted. Others urged Palestinians to “respond to settlers, close roads and burn (settler) properties.” Israeli military orders prohibit peaceful demonstrations – including displaying Palestinian flags, banners and other symbols publicly. Nonviolent resistance is considered “terrorism.” Soldiers and police brutalize Palestinians freely – at times attacking them with live fire. Nations committing these type crimes are considered outlaw regimes under international law – none more ruthless than America and Israel.